Construction of the USS Grayback (SS-574) was authorized in 1953. The keel was laid 1 July 1954 Mare Island Naval Shipyard, Vallejo, California and launched 2 July 1954 (Sponsored by Mrs. John J. Moore, widow of the last CO of the first Grayback) and commissioned 7 March 1958. 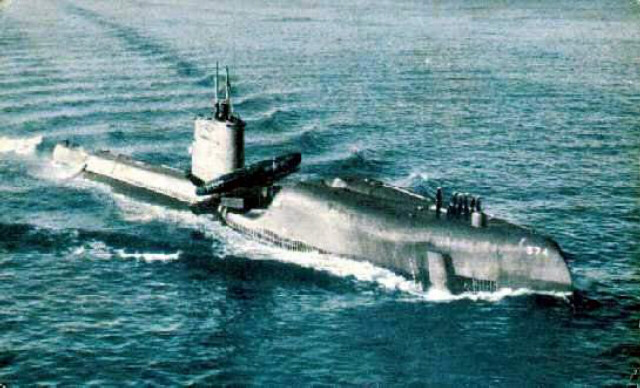 The Grayback was initially designated as attack diesel submarine but conversion to guided missile submarine (SSG-574) capable of firing the Regulus II sea to surface missiles began in 1958. The Grayback successfully launched it's first Regulus missile in September 1958. On 9 February 1959 Grayback departed Mare Island, CA for her permanent home base and arrived in Pearl Harbor, HI on 7 March 1959. The Regulus missile program ended in 1964 and the USS Grayback was withdrawn from active service. A second conversion was authorized in 1967 and the conversion began at the Mare Island Naval Shipyard November 1967. The conversion was originally estimated at $15.2 million but actually was $30 million. 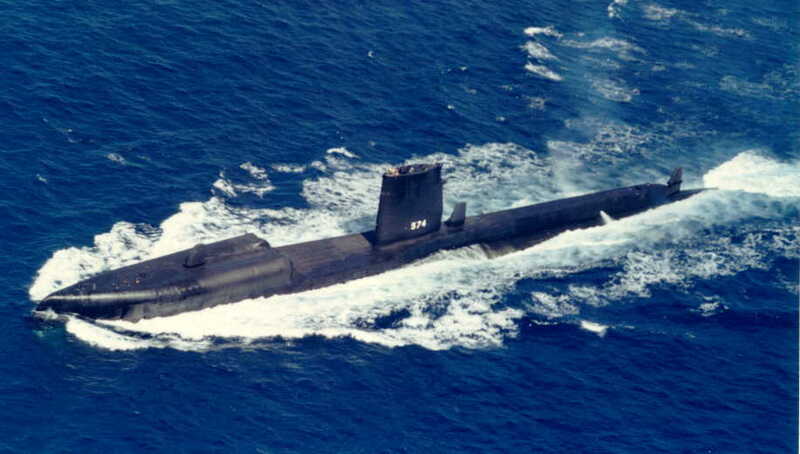 She was re-classified from a SSG to LPSS 30 August 1968 (never officially designated APSS). During conversion her sail was extended 10 feet, auxiliary tanks #3 and #4 were added to the forward position of the engine room, the missile chambers were converted to carry 67 embarked troops and SEAL swimmer delivery vehicles (SDV), and a diver's decompression chamber was constructed in the starboard hanger. By adding the auxiliary tanks to the engine room her length was extended 12 feet to an overall length of 334 feet. The Grayback was decommissioned for the second time on 15 January 1984 at Subic Bay Naval Station in the Republic of the Philippines. After decommissioning, the USS Grayback was given the honor to make it's last and final dive in the South China Sea on 13 April 1986 where the USS Grayback remains today on eternal patrol. Dust off your sea stories because plans for our next reunion have been finalized. Dennis Wiley and Ken Anderson have done the leg and paper work and a contract has been signed with the Boomtown Casino & Hotel. The dates for events will be Tuesday-Wednesday-Thursday, 7-8-9 May 2019. It is recommended that you make travel plans to arrive Monday, 6 May and depart no earlier than Friday, 10 May. Arriving on Monday 6 May 2019 you will be able to attend all three days of the reunion and you will not miss any of the sea stories. Our hospitality suite, stocked with snacks and beverages, will be in Room 2219 of the North Tower of the hotel. Our Guest Speaker is Gunny Mike Rios and his topic will be The Honor Flight program for veterans. There are chapters throughout the U.S. including one in Reno. We anticipate following a schedule similar to our past reunions to include all hands breakfast buffet Wednesday, 8 May with some business discussion (such as where next reunion)and farewell dinner buffet Thursday, 9 May. Registration fee covers the hospitality room and the various condiments & refreshment & noon treats and many other cost and Tuesday morning breakfast with some business discussion and finally Thursday night farewell banquet and the registration fee is $75.00/person will cover all these activities. The Registration form is attached (in both Word and WordPerfect and PDF). To register please print out the registration form (attached below) and complete the form and mail to Mike Dimmick. Make checks payable to Grayback Reunion. Mail the form to Mike Dimmick, 5800 Perfect View St, Las Vegas, NV 89130. Several hotel rooms have been blocked in the North Tower at a discounted group rate of $57.99 Monday-Thursday for a 2-Queen/1-King room (with fees & taxes total is $78.53/night). To receive the discounted room rate make your reservation by calling (775) 345-6000 or 1-877-726-6686; use Group Code AUSSG. Check-in is 4:00pm and Check-out 11:00 am. Because of the Grayback Group-Code discount it is necessary to make your reservations by telephone. Note: Most Of Our Attendees Will Be Staying At The Boomtown Casino & Hotel. There Is A Number Following Each Shipmateâ€™s Ladies Name Indicating Their Type Of Lodging During The Reunion. There Is A Legend Listed Below.